Bhaktapur has always been known for the unique architecture of its medieval squares and buildings. But the 2015 earthquake destroyed nearly a quarter of this ancient city, including monuments in its famous palace square. Nearly three years later, with its well-defined guidelines, economic sources and a trained workforce, Bhaktapur is steadily rebuilding itself. Unlike in Kathmandu where foreign donors are competing with each other to help reconstruct, here it is the municipality and the locals that have taken charge. After the earthquake, many donors pledged monetary support for the recovery of the heritage sites in Kathmandu Valley including Bhaktapur, which was originally restored under a German project in the 1970s. “Various international organisations, China and Japan expressed interest to rebuild the entire city. The German government in fact wanted to conduct another Bhaktapur Development Project like in the 70s and 80s,” recalls Surya Bhakta Kharbuja, senior engineer at the Heritage Conservation Unit in Bhaktapur Darbar Square. The Germans wanted to return to Bhaktapur, where many of the monuments they had restored 40 years ago withstood the earthquake, and they tried to convince the local authorities here to allow them to support another urban renewal project. The municipality declined the offer and decided to rebuild the heritage using its own resources with help from Department of Archaeology (DoA), the Guthi Sansthan and the National Reconstruction Authority (NRA). 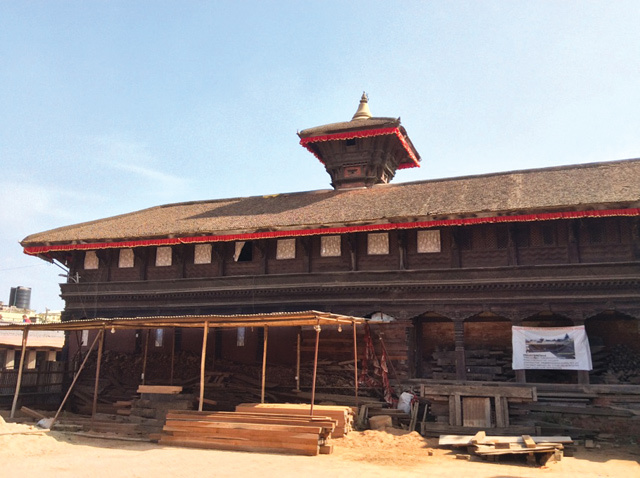 Even before the earthquake, Bhaktapur municipality had established norms for heritage conservation and restoration. After 2015, reconstruction was delayed for five months because although the NRA had directives for new concrete buildings, none were provided for traditional clay-wood-brick structures. The city had to come up with its own guidelines to preserve the old construction methods. Since 2015, the municipality has documented 116 archaeological heritage sites for reconstruction and renovation with monuments on the tourist routes and those promoting tourist business and trade have been given the priority for rebuilding. So far, 23 projects have been implemented, including ten for the monuments in Durbar Square and two in Dattātraya Square. The Bhimsen and Narayan temples at Dattātraya and the three Narayan temples in Darbar Square have already been completed, three other monuments in Ta:mari Square are planned for renovation by next year. The stone Vatsala Temple, Lohan Dega and Kedarnath Temple in Darbar Square are under construction. Of the total budget for reconstruction, 15% came from the government, 35% from the entry fees of tourists, 10% from taxes, and the remaining from various semi-private sources. Since 2015, 20% of the budget has actually been spent on a yearly basis for reconstruction and maintenance. The DoA has provided Rs400 million. An Archaeological Excavation and Reconstruction Committee does the micro-evaluation and reports to both the municipality and DOA. If required, reports ultimately go to the NRA. Senior advisers from the Institute of Engineering and Khwopa Engineering College provide technical support to the municipality. “Only traditional construction materials like wood, brick and lime mortar are used for historic monuments," says Kharbuja. "All the newly reconstructed temples have internal wooden structures that provide flexibility and support." The timber comes from Tarai districts and is high quality sal hardwood procured through the National Timber Corporation at a set price of Rs4,100 per cubic feet. Other than lime powder, all raw materials including bricks and stones came from within Nepal. The five month Blockade in 2015 slowed down work, but things have picked up again. One problem has been that some skilled craftsmen have left Bhaktapur for better paying jobs elsewhere. But many others are staying behind to learn the skills and transfer them to future generations. Besides the government, private donors have also contributed towards heritage preservation. The municipality in fact welcomes such undertakings at communal sites. Small temples, rest houses (pāṭis) and minor shrines are being taken care of by local volunteers. Unlike the major heritage sites where tenders are announced and contractors are given tasks, local preservation work initiated by the community only needs a simple application in order to be approved by the municipality. Although this city of 80,000 inhabitants is much smaller in size than historic Kathmandu, the level of enthusiasm and consciousness among the administrators and also among the general public sets Bhaktapur apart. 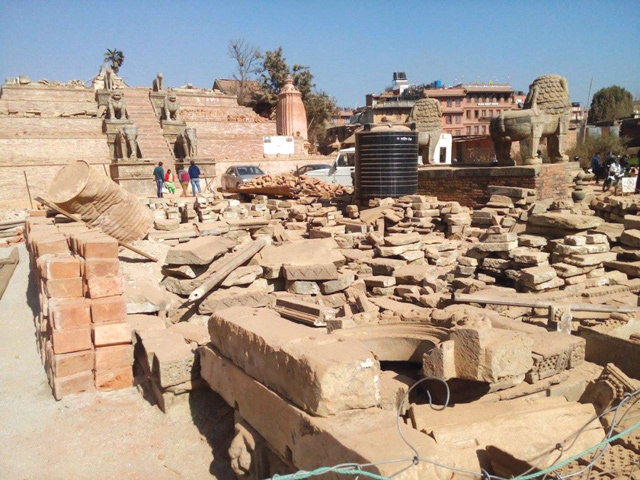 The difference could be seen even before the 2015 disaster, and Bhaktapur offers plenty of lessons on how to manage reconstruction.